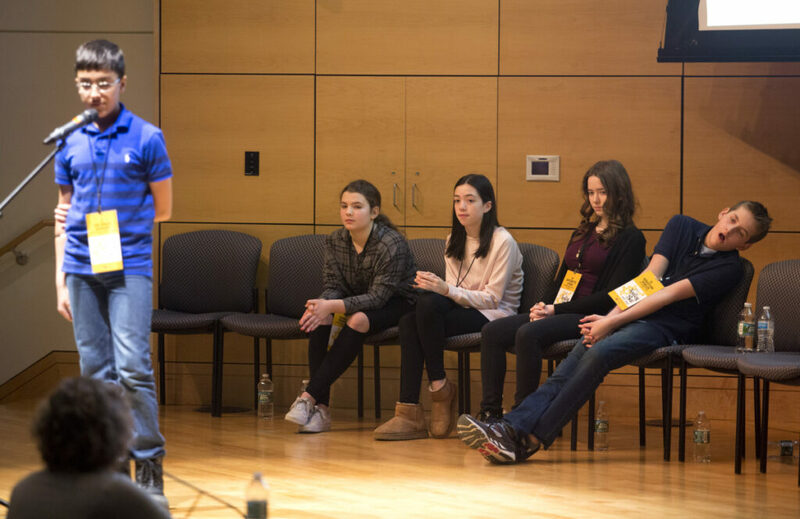 Sebastian Shields, a seventh-grader from Saco Middle School and champion of York County, was the last speller in the first round of the Maine State Spelling Bee. Shields turned to the three-judge panel and belted out the correct seven letters, with nary a thought to remaining “stoic” (his Round 7 word). 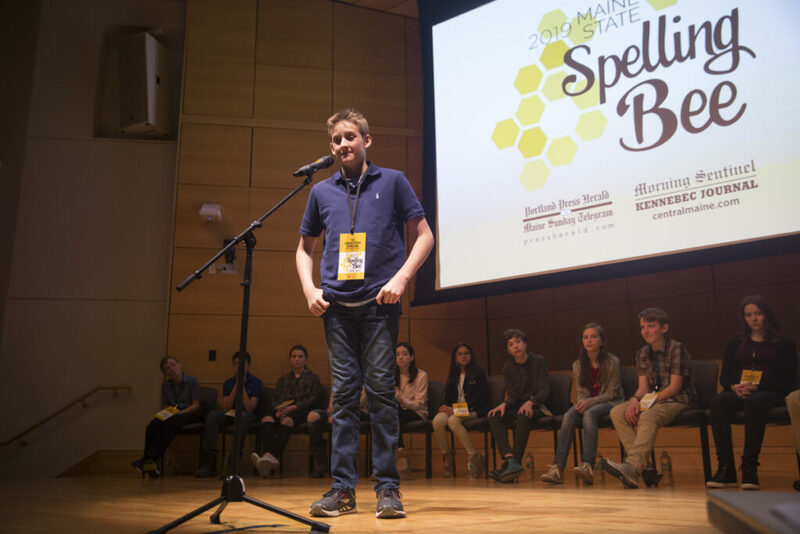 He was the Maine champion, earning an expenses-paid trip to the Scripps National Spelling Bee in late May in National Harbor, Maryland, outside of Washington. His victory ended a five-year run of eighth-grade winners that began with Lucy Tumavicus of Portland in 2014. 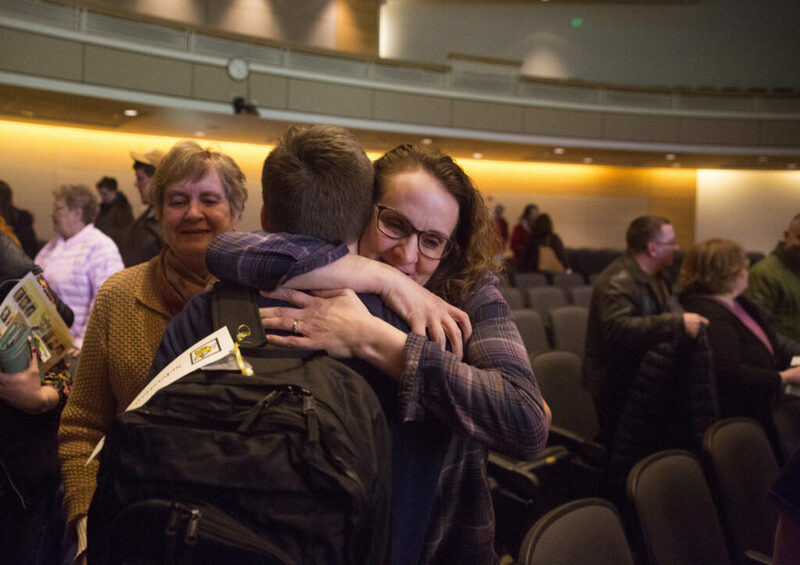 Now in her first year at Tufts University, Tumavicus was also the last Maine champion to triumph with no prior experience in the statewide bee. Like Tumavicus, Shields is a swimmer and a distance runner. In fact, he passed up Day 2 of a three-day swim meet in Orono to take part in Saturday’s bee, along with the 14 other county champions. Only Waldo County, without a school in regional competition, was unrepresented. Rebecca Aponte, a home-schooled sixth-grader from Blue Hill whose older brothers Colin (2018) and Brandon (2013) are former state champions, finished second. 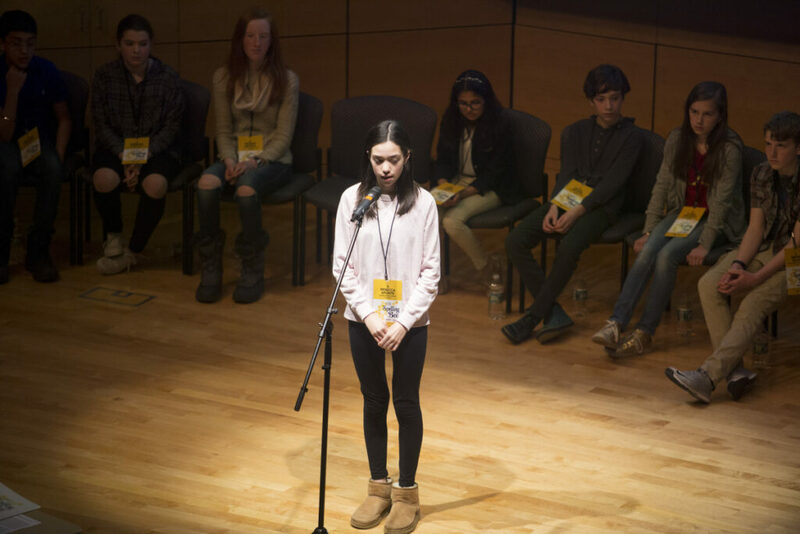 Saturday marked her sixth appearance on the University of Southern Maine’s Portland campus for the state bee, which is sponsored by the Portland Press Herald/Maine Sunday Telegram and Dead River Co., but her first time actually stepping up to the microphone. The field winnowed to five spellers after Round 15 and they remained perfect for the next 23 rounds. Aroostook County champion Vir Singh Ranger of Greater Houlton Christian Academy, Cumberland County champ Bella Ferriter of Cape Elizabeth Middle School and Penobscot County champ Antionette Logan of All Saints Catholic School in Bangor joined Aponte and Shields in methodically knocking off ever-more-difficult words from two study lists provided to all the schools conducting bees of their own. In Round 39 – after Ranger had disposed of “schottische” and Ferriter took care of “galjoen” – Uzzi turned to words pulled from the Merriam-Webster Unabridged dictionary. In spelling parlance, this is known as going off-list. 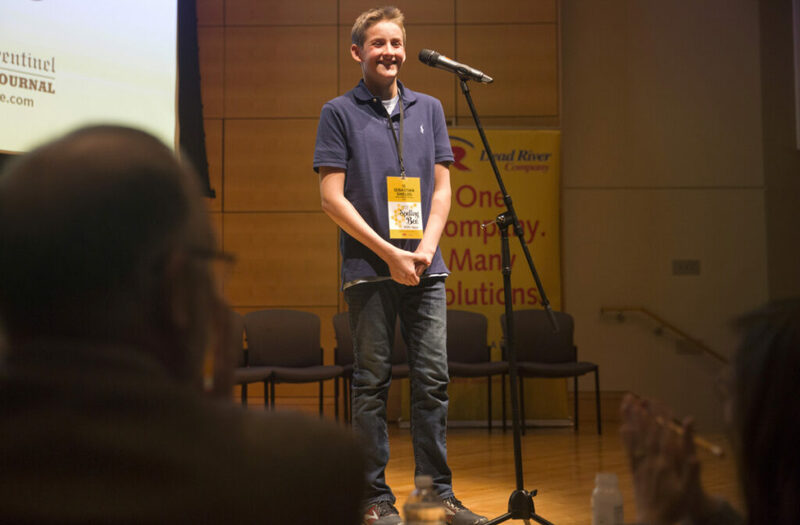 Logan, the lone remaining eighth-grader, mistakenly put an “a” in “reverend” in Round 39. Ferriter said she was thinking of Pompeii when she stumbled on “Bombay” in Round 41. Ranger, Aponte and Shields all missed their words in Round 43 – with Shields adding an extra “p” to “poplin” – so all three continued anew in Round 44. Finally, in Round 48, “inveigh” was the downfall of Ranger and one round later, Aponte forgot the second “a” in “chaplain” before Shields made no mistake with “inerrancy” to set up the championship round and his collision with “colloid,” which is a gel or emulsion. 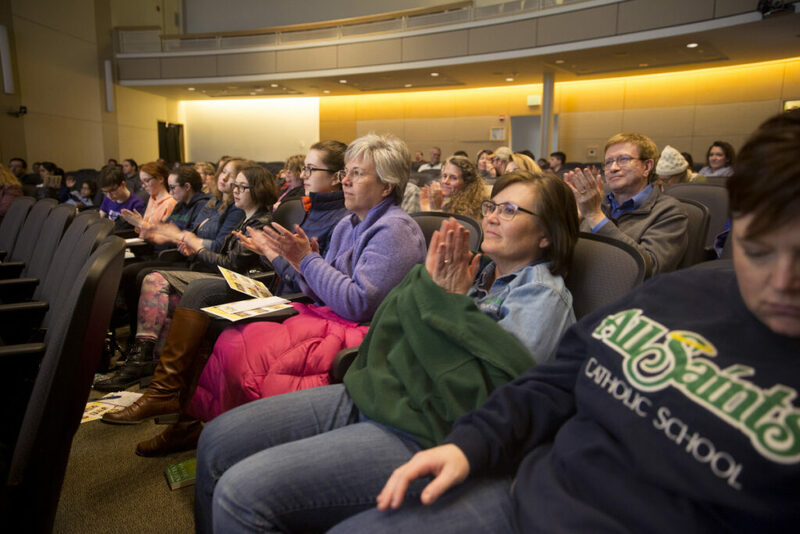 In earlier rounds, haste felled two spellers, including seventh-grader Nina Dabas, who finished in a three-way tie for second in 2017 but did not repeat as Kennebec County champion last year. In her rush to spell “jackal” she mistakenly blurted “gee” before quickly saying “jay” and continuing the correct spelling. “I think I went too fast,” she said. Twenty minutes after the bee ended, Shields still hadn’t lost his grin. He still seemed stunned.